“Russian patience is coming to an end,” Andrey Kortunov, head of the Kremlin-funded International Affairs Council, told Bloomberg in a rare assessment that actually attempts to gauge Russian interests two years into a downward spiraling relationship with the Trump administration, as opposed to the more common mainstream analysis that begins with Russiagate and ends with trying to square Trump’s anti-Russian policies according to some 4-D chess decision-making fantasy scenario. After interviewing multiple high level unnamed Kremlin insiders, Bloomberg concluded that Russian frustration has reached a breaking point. The report noted that “Donald Trump may have stood up Vladimir Putin once too often” after snubbing Putin twice in less than a month. Feted by Russian lawmakers with applause and champagne after his election in 2016, Trump’s mercurial decision-making is increasingly seen as a liability in Moscow. 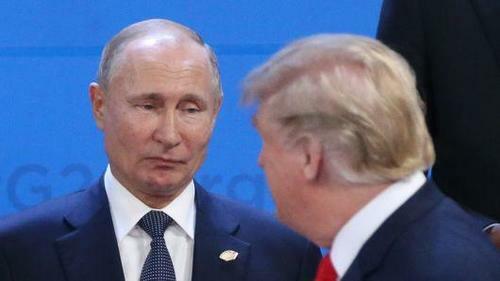 Russian officials were taken aback when Trump tweeted that he was canceling talks with Putin at the Group of 20 summit in Argentina hours before they were due to meet last week, a decision one of them called really bad. Since then, Russian frustration has steadily grown, according to four senior officials, who asked not to be identified discussing internal matters. So much for MSNBC-style conspiracizing over Kremlin-White House back channel puppet-mastery… but we don’t expect such vapid commentary to let up anytime soon regardless. What does it mean for the two superpowers finding it hard or impossible to sit down at the same table? Here’s the scorecard representing increasingly dangerous trends which certainly don’t bode well for global stability and peace that’s about much more than two leaders at odds as geopolitical tensions build, according to Bloomberg’s findings. New arms race As Putin warns of a new arms race over Trump’s threat to abandon a landmark nuclear treaty, the Kremlin’s left itself with little alternative than to dig in for confrontation over U.S. demands. Sanctions: [Russia] may also retaliate against possible future U.S. sanctions after Putin held back from taking measures in response to earlier rounds of penalties… Tensions may spike further in coming months if the U.S. decides to impose fresh sanctions over alleged Russian election meddling. Ukraine, Syria, Iran: Russia takes a harder line in talks with the U.S. on thorny issues including arms control, the conflicts in Ukraine and Syria and the Iranian nuclear accord. Doors closing on diplomacy: While Russian officials previously expressed “understanding” of Trump’s political difficulties amid U.S. investigations into meddling, this time, they openly cast doubt on him. The president blamed Russia’s naval clash with Ukraine near Crimea for the cancellation. His decision was announced hours after his former personal lawyer, Michael Cohen, pleaded guilty to lying to Congress about plans for a Trump real-estate investment in Moscow. After the recent Trump snubs Kremlin spokesman Dmitry Peskov said the idea of Putin visiting Washington — as was offered during the two leaders’ prior Helsinki summit — is now “out of the question.”This means there’s likely no chance of a meeting before the next G-20 summit in Japan in June, if even then. A key theme among officials and Russian think-tankers interviewed was the perception that Russia is constantly being told to “give something” to improve relations with Washington, but in return is only suffering a humiliating cold shoulder in the process. Senior members of the ruling United Russia party even regretted Trump’s victory, though Putin has dismissed the notion that a presidency of Democratic candidate Hillary Clinton would have averted the current frictions.